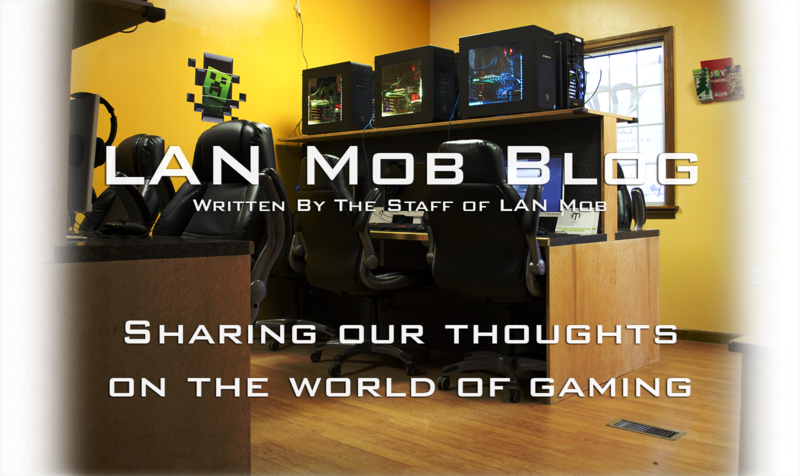 I've touched on my perspective of the stealth game genre a few times during the history of LAN Mob's blog in various posts. To reiterate, I strongly believe stealth games present one of the most challenging and formidable gaming experiences for both players and developers. There's a massive exchange of information going on between the player and the game and simple imperfections in UI/the HUD can turn a great formula into a bad experience, and these errors feel multiplied 10 full in a genre where patience is key. I cannot stress my love of stealth games enough (check out our Aragami Game Preview post for a longer rant about this if you're interested) and I feel after many long years I've played the best and the worst this genre has to offer. Back in 2012 when Arkane Studios released the original Dishonored it was very obvious to me it was a golden entry in the genre, right out of the gate. 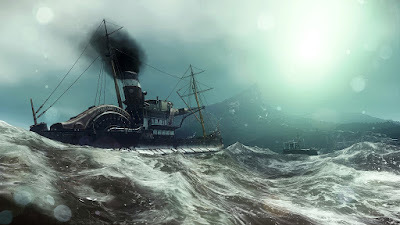 The "gaslight/steampunk" stealth title managed to create an incredibly immersive world and challenge players to follow their own path through it. I'm happy to say the game's recently released sequel, Dishonored 2, has managed to surpass it's predecessor in some of the grandest and most subtle ways, but clumsily trips through the dark plot in a few places. Dishonored 2 takes place 15 years after the events of the original game. This time around, players have the option of playing Corvo Attano, the Royal Protector/main protagonist of the original title or Emily Kaldwin, the current Empress of Dunwall/Corvo's daughter. This option immediately sets the sequel apart from the original, with both characters offering different play styles and options for dealing with different situations, while directly effecting the narrative. While the game begins and ends in Dunwall, most of the narrative takes place in the southern city of Karnaca, capitol of Serkonos. I do not intend to give any critical plot points away, but Dishonored 2's plot is a fantastic example of what it means to weave scenarios that keep players intrigued and invested. 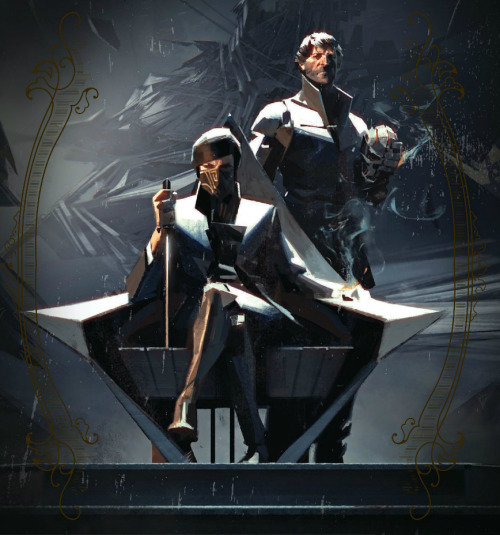 Using the dramatic events of the original Dishonored as a launch pad, Arkane Studios continues to develop an incredibly well fashioned fictional world of political unrest and conspiracy that feels similar to the first game but manages to be fresh and exciting. The first major problem presented in the narrative is a mysterious figure known as "The Crown Killer" who seems to be targeting and assassinating political adversaries of our protagonists, creating a facade of blame aimed towards Emily and Corvo. These events lead to a coup on the throne of Dunwall by Emily's long lost Aunt, working in tandem with the Duke of Serkonos. 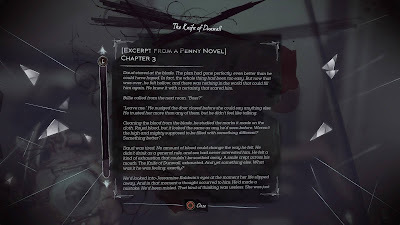 Events play out and eventually players are forced to choose their character and render the other absent for the rest of the narrative. Although stressing Emily's struggle for independence and having almost nobody to rely on, this choice from Arkane bummed me out a little. I understand how not having Corvo at her side creates some very potent character growth for Emily, I would have loved to see what the duo is capable of and what their interactions would be like. Cutting Emily out of Corvo's narrative creates a parallel to the original Dishonored, and well Arkane does a great job of doing it, once again I can't help but wish we could have got some father daughter team up action. The "Dreadful Wale" serves as a hub between missions in Dishonored 2. It is also an anagram relating to events in Dishonored 1. Can you figure it out? After spending some time in Dunwall players set sail for Karnaca, a stunningly beautiful coastal city. I love Dunwall overall, but the coastal city of Karnaca in the country of Serkonos was an excellent change of scenery for fans of the first game. The Dishonored series is definitely dark and I wouldn't want it any other way, but it was nice to see some grass here and there! Gameplay is divided into chapters with a small respite between missions aboard the "Dreadful Wale", a small ship piloted by the mysterious Meagan Foster. Each of the 9 missions in Dishonored 2 manage to be different then the last, with some of the craziest "themes" I've ever had the pleasure of sneaking through. From an ornate Clockwork Mansion created by a genius to a Chapter revolving around time traveling (being stealthy in two timelines at once is...an experience), I never found my goals to be monotonous, which is a problem that plagues many stealth games. Before I get into gameplay, I'd like to touch on one of Dishonored's strongest assets as a stealth game. Karnaca, homeland of Corvo and the first place Emily Kaldwin has visited without her cloak of royalty. creates a dark and immersive world I was genuinely invested in. However, compared to the plot of the first game, I have to say Dishonored 2 falls short more then a few times. Ironically enough, I was not a fan of the opening sequence or the abrupt, unsatisfying and predictable ending. I would have loved some more interaction between Corvo and Emily and it feels the supporting cast wasn't explored as much as they could have been. I suspect DLC is around the corner, and maybe it will bring what I'm looking for to the table. On a positive note, I'd like to commemorate Arkane for doing a stellar job on casting voice actors, utilizing another asset to bring their world to life. There's some massive AAA names lending their voices to Arkane's title such as Rosario Dawson as Meagan Foster, Vincent D'Onofrio as Duke Luca Abele, Sam Rockwell as Mortimer Ramsey and my personal favorite, Robin Lord Taylor as The Outsider. 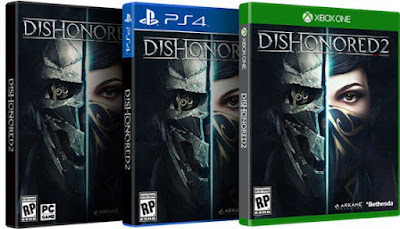 As mentioned above, Dishonored is a game series that allows players to carve their own path, which directly effects narrative but most importantly gives the player the freedom to act as they see fit. With this formula in place, Arkane masterfully crafts a playground of a world, equips players well and let's us have at it. Players are given nothing short of an arsenal - Pistol and Crossbow with various ammunition types, a collapsible blade, various bombs, mines and traps; oh and supernatural powers! Just like in the original Dishonored, players take a dip in the Void and receive the "Outsider's Mark", a brand given to those selected by The Outsider himself, bestowing some amazing and unique abilities. Corvo is equipped with the ability to freeze time, possessing living things and a "force push" ability called Windblast, among others. However, with the addition of Emily as a playable character, Arkane has used the opportunity to introduce a smorgasbord of new abilities. Emily has "Domino" a personal favorite, which "links the fates" of multiple characters together, allowing Emily to dispatch a small squad in one move. Emily also has the ability to create Dopplegangers, teleport short distances (just like Corvo's Blink) and even become a shadowy beast...thing. With a toolbox of destruction (or mercy, based on your choices) and unmatched level design, players are free to deal with things as they see fit. Dishonored utilizes a "Chaos" system to shape the world based on their actions. The Chaos system is incredibly complex, but thankfully the team over at Now Loading have written a Chaos Guide, explaining the intricacies. Despite the Chaos system being in place, Arkane still does not cage players with labels like "right or wrong". Play Dishonored as you see fit, and the world will shape around you. You get to feel in charge, and it's marvelous. I've had the pleasure of playing Dishonored 2 on PlayStation 4, so I have not experienced the PC problems plaguing the game's release on the platform. I can only hope things get straightened out so people get to experience what Arkane has to offer. On PlayStation, Dishonored runs well, with no frames dropping, responsive and expected interactions and the beautiful expansive coastal region of Serkonos rendering well. Ultimately, I have to give Dishonored 2 a ton of praise. Level design, world building, alternate narrative exploration and solid stealth mechanics have created a remarkable experience. I've had a blast conversing with friends who have also been playing through the game, picking their brains about their decisions in certain points or hearing stories about their various actions, such as Domino Wall of Light maneuvers (good job Dictator). I've currently only completed a Low-Chaos-Emily run and a small bit of a High-Chaos-Corvo run and already amassed 25 hours or so in the world of Dishonored. Comparing the game to its predecessor, it's clear choices carry a little less weight, for better and for worse, and the plot is definitely a bit drier this time around. That being said, Dishonored 2 still manages to be almost the perfect sequel I was hoping for. Dishonored 2 is one of the most creative, immersive and well designed stealth games I have ever played, and my own actions within the world resonate with me even now, and it's hard for me to NOT suggest it to all different types of gamers. The world is worth exploring and becoming immersed in, and Arkane Studios let's you do it any way you wish. EDIT : I actually plan on writing some more about Dishonored 2, after losing my life to FFXV for a while. I find myself pretty infatuated with stealth games more then almost any other genre, and I can't help but replay them over and over, especially a game like Dishonored. I feel a weird OCD-esque tendency to eat the game alive and uncover everything it has to offer. Hopefully I can make it happen. Thanks a ton for reading!